Chicago locals and tourists alike are very familiar with the glamorous theaters that populate the Loop, from the internationally renowned Goodman Theatre to the PrivateBank Theatre. However, far fewer know about the vibrant Off-Loop scene that extends from Rogers Park to Jefferson Park to Pilsen and beyond. What is “Storefront Theater,” you ask? Well, if you ask five different people for the definition, you’re likely to get five different answers. While the precise definition is elusive, everyone can agree that it’s a place where emerging artists can experiment and take adventurous risks. 1.. A Storefront Theater is a small, intimate house, and literally might be in a storefront. 2. A Storefront Theater is a training ground for younger artists. Ever wonder where actors like Michael Shannon, David Schwimmer and Gary Sinise got their starts? They all co-founded and began acting in their own storefront companies: A Red Orchid Theatre, Lookingglass Theatre and Steppenwolf Theatre, respectively. While the latter two have grown into major Tony Award-winning regional theatres, A Red Orchid still occupies its storefront space in Old Town. 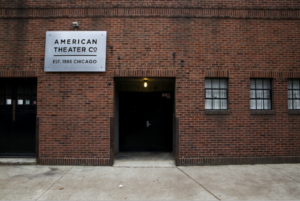 Young actors who get their start in Chicago often train by gaining experience with these smaller Storefront Theaters before playing in the city’s big houses. 3. A Storefront Theater is a company that takes risks. You thought American Psycho was controversial? You ain’t seen nothin’ until you’ve seen some of Chicago’s grittiest storefront theaters. Chicago doesn’t shy away from the darker side of the human experience, even if it makes the audience squirm in their seats. 4. A Storefront Theater is a theatre that showcases particular voices or types of work. Chicago is home to over 250 theatre companies. That means there is room for companies to dedicate themselves to a specific canon of stories. About Face Theatre and Pride Films and Plays present pieces about the LGBTQ community. Teatro Vista specializes in world premieres by Latinx playwrights and reinterpretations of classic works through a Latinx lens. Silk Road Rising offers a similar experience, highlighting South Asian stories. Rivendell explores the work of female theatre artists. 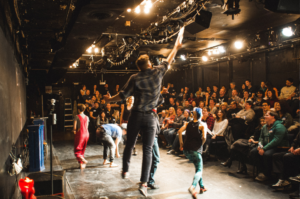 Because these small theaters are almost omnipresent, it allows institutions to focus on a particular niche and share their individual stories with the greater community. 5. 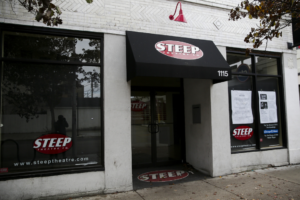 A Storefront Theater is connected with and gives back to its local community. 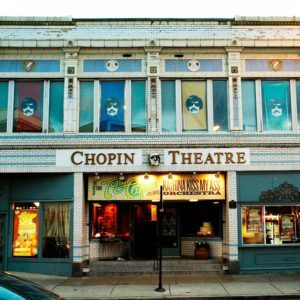 Storefront Theaters are just as closely knit with their immediate community as any other local business. 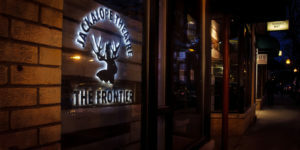 Jackalope Theatre Company uses its Edgewater storefront both as a performance venue for small projects and also as an event space, while The Neo-Futurists hosted the most recent Andersonville Honors Gala to recognize outstanding business for their contributions to the neighborhood.